Marvel at the full prowess of Milo’s plan­e­tary intel­lect! Just dis­cov­ered this. It’s fun! I like the car­toony art–I can see this as an ani­mated fea­ture. And the sto­ry­line is just a little far out in a “mad scientist” way. Keep it up. Such is our intent, mac­snafu! Thanks for stop­ping by. Hey, stum­bled upon this some­how. The comic is pretty win; you’re book­marked. He looks like GWB in the last panel. Or is that the joke and I’m just stat­ing the obvi­ous? If so, carry on. I was just watch­ing The Twi­light Zone tonight because it’s really good. Is Milo enter­ing it, or is he just on the out­skirts? This strip is bril­liant! I just fin­ished read­ing through the archives! 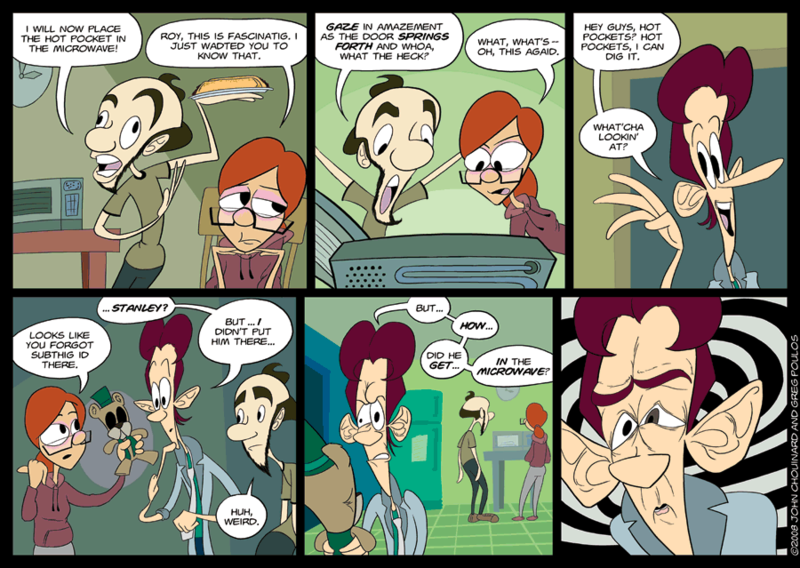 As a fellow web­comic cre­ator I really admire the zany char­i­ca­tured art style, and the great dialog.